As named, the CD contains two pieces for viola and symphony orchestra, both performed by the distinguished violist Anna Serova, with the Croatian Radio & TV Symphony Orchestra, conducted by maestro Nicola Guerini. When Anna listened to the recording of Requiem’s premiere (performed by Rainer Moog, in Kiev) she told me that she wants to perform and record this piece herself. Together with her manager Alessandro Panetto and conductor Nicola Guerini, they made it happen: Requiem was recorded for NAXOS by the Croatian Radio and TV Symphony Orchestra. When planning the Requiem recording, Anna asked me to write another composition for the disk. This is how Poem of Dawn was born: I wrote and dedicated this piece for Anna. Inspired by Nikolaj Kun’s Legends and Myths of Ancient Greece (1914), I used the style and compositional methods of the Russian Romantic school, which I believed to be particularly well-suited to the warm, expressive sound of Anna’s viola playing. Poem premiered at the Il Settembre dell’Accademia 2013, Teatro Filarmonico di Verona (Italy), and was recorded, together with Requiem, for the NAXOS label. The NAXOS CD was released in June 2015; that same year, it received the Supersonic Award from Pizzicato Magazine and was nominated for the 2016 International Classical Music Awards (ICMA). Below are some samples from the CD (the CD is available from Amazon). 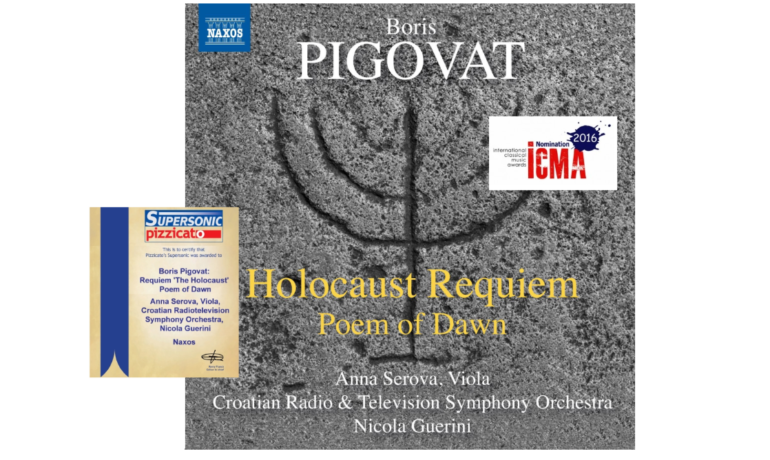 In spite of the more dramatic Dies Irae, Boris Pigovat’s Holocaust Requiem is a music of striking serenity, beauty and depth, becoming highly emotional in the performance by violist Anna Serova and the Croatian Radiotelevision Symphony Orchestra. The poetic and evocative Poem of the Dawn is no less appealing. Pigovat is a remarkably fine orchestrator. Poem of Dawn makes a fine contrast to the melancholy, passion and tragedy of the Requiem. Nevertheless it is the very fine Holocaust Requiem that I will return to most often. 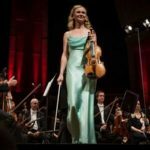 Anna Serova proves to be a first class soloist with the Croatian Radio and Television Symphony Orchestra under Nicola Guerini turning in first class performances. Remembered on disc four and more decades ago, the famous Zagreb Radio Orchestra is the renamed orchestra that is providing a high impact Holocaust Requiem and the gorgeous sounds for the land in paradise created for the Poem. A thought provoking release much recommended. I composed Poem of Dawn in 2010 for violist Anna Serova, to whom it is also dedicated. The morning is near… There is a faint light in the East. Aeos and Pyrios, the morning stars and harbingers of Dawn, shine brightly in the East. There is a gentle breeze. The light in the East glows brighter and brighter… In vivid colours, on rosy wings, Dawn is soaring into the illuminated sky, drenched in rosy light. Dawn pours dew from her golden urn onto the Earth, and the dew sprinkles the grass and flowers with glistening, diamond-like drops. All is fragrant, all around. The waking Earth happily greets the Sun – Helios. I wrote Poem of Dawn using the style and compositional methods of the Russian Romantic school, which I believed to be particularly well-suited to the warm, expressive sound of Serova’s viola playing. 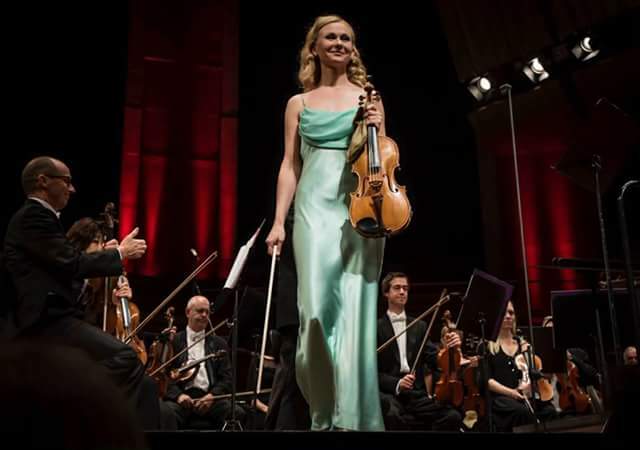 The premiere took place at the Il Settembre dell’Accademia 2013, Teatro Filarmonico di Verona (Italy), performed by Anna Serova and the Symphony Orchestra of Croatian Radio and TV, conducted by Nicola Guerini. 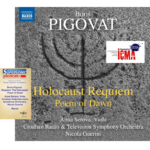 Poem of Dawn was recorded, together with Holocaust Requiem, for the Naxos label. In June 2015, the CD was released by Naxos, received the Supersonic Award from Pizzicato Magazine, and was nominated for the 2016 International Classical Music Awards (ICMA). In September 2017, Anna performed Poem of Dawn in the 44th International Viola Congress, in Wellington New Zealand. I obtained a special approval to share the video of that amazing performance with my followers. Click here to visit the event page where the video is available. Below are some samples of the premiere and some photos from the event. The Poem of Dawn, composed for the distinguished violist and soloist on this disc, Anna Serova, is a warm natured tone poem in the Romantic tradition, its message one of love a beauty. This is a beautifully textured, lyrical work. Its main interest lies in the viola solo and in Serova's lyrical and beautiful performance on her instrument. I am referring to Pigovat's rapturous "Poem of Dawn," which knocked my soaring soul out of its body and had me (still has me!) playing it repeatedly. If you love the music of Claude Debussy and have found yourself swooning over Ernest Chausson's "Poeme de l'amour et de la mer," you're sure to fall irretrievably in love with this work.